In this module you will learn how to use the Stacked Bar Chart by Akvelon. 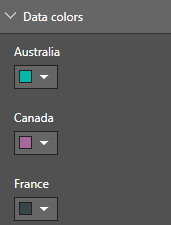 This version of the Stacked Bar Chart sets itself apart because of the selection rectangle that allows you to highlight specific regions of the chart to filter other parts of your report. Similar to the native bar chart but includes a selection rectangle. This allows you to select a specific cluster of values. 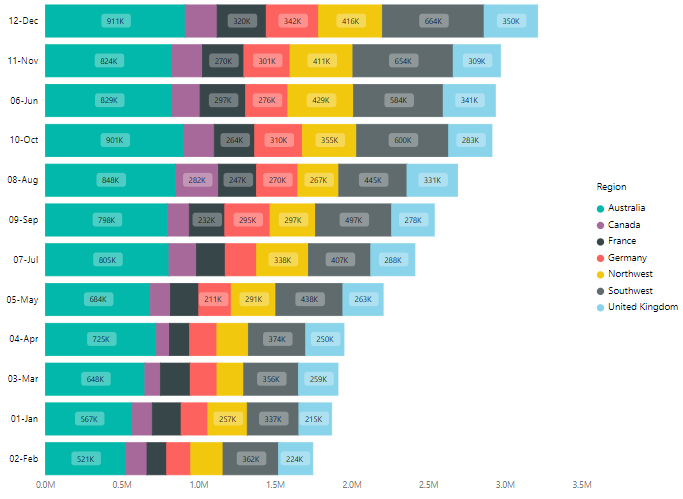 This Bar Chart shows total sales by region and month. Under the Selection save settings you don’t necessarily need to make any changes but this records what values are selected in the chart. Under the Data colors section you can change the colors used for each series in the chart. Using the Legend properties you can change the appearance and location of the legend on the chart. Changing the Y-Axis section allows you modify the appearance of the Y-Axis section of this chart. Changing the X-Axis section allows you modify the appearance of the X-Axis section of this chart.